Kevin Z. showed me the above quote the evening before the race when a bunch of us met up in Logan, UT for a pre-race dinner of pizza and good conversation. 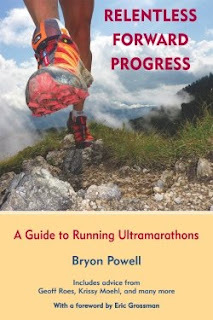 At the moment I read it, I liked it, but I had no idea it would carry me through most of my race. I must have repeated that second line a hundred times throughout the race. Until the final descent down into Fish Haven, ID, and the finish line, where I exclaimed aloud to Geof, "lets descend this goddamn mountain!" I suffer from an extreme inability to write short 100 mile race reports. I can't help it. It's in my fabric. So where do I begin?! Bear 100 was a fantastic experience for me. All sorts of cosmic and spiritual stuff aligned and conspired to give me the race of my life thus far. That's sort of dramatic to put it that way, but seriously, it was my most well executed race to date. Not my fastest but darn near close, and considering the race (my first ever real mountain 100!) and it's much higher degree of difficulty, I feel this effort has far eclipsed my PR race at Javelina Jundred last year. With over 22,000 ft. of elevation gain and an equal amount of descent, as well as running between 4,800 ft. and a little over 9,000 ft. elevation, I feel pretty pumped about my performance. This is the most elevation gain I've ever had in a race...I'm talking about more than double what I've done before. So that's pretty cool. Okay, so enough of that. We made the insanely beautiful 1.5 hour drive north to Logan on Thursday afternoon for the pre-race meeting, almost stopping multiple times to take pictures of the leaves through the canyons. Holy crap it was pretty! 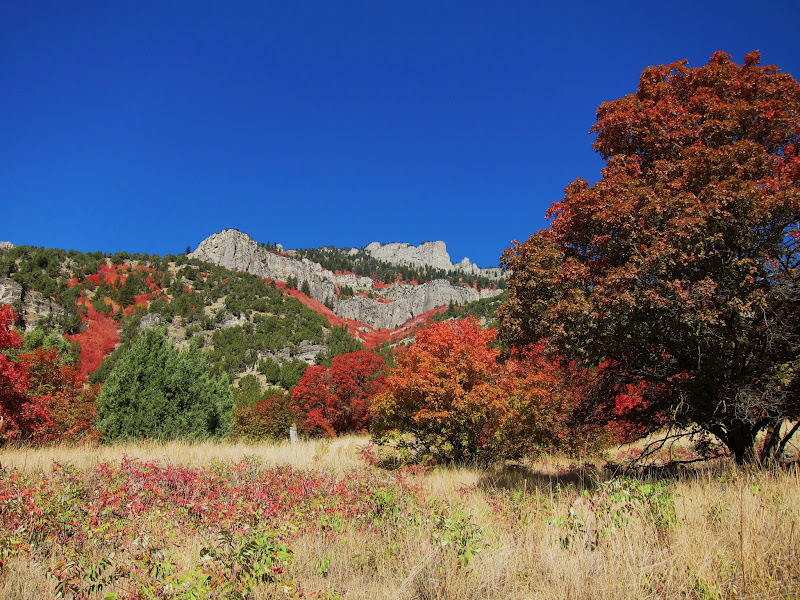 Reds, oranges, yellows, oh my! The meeting was brief and informative and I felt surprisingly calm and collected as we headed to Jack's Woodfired Pizza for dinner later that evening. I commented numerous times on how relaxed I felt. After dinner, I finished packing, set out my outfit for the next day and then watched the season premier of Grey's Anatomy. What's more relaxing than that? :) Rob, crew member and pacer extraordinaire, arrived after Grey's wrapped up and we had a brief "planning" session, which mostly consisted of PBR and joking around. 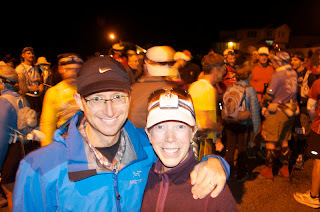 The start line was buzzing...230 bodies milling about in the cool morning air. I checked in with the RD and then...waited. I thought about very little; in fact I felt very clear-headed and just ready to get the show on the road. I had no idea what the day really held for me, I just knew it was going to be a great day. I didn't even hear the countdown, if there was one; people just started running suddenly, so I bid the guys farewell and was off! It's about a mile or so of uphill pavement to get to the canyon trailhead. My legs felt great so I ran most all of it. I slowed to a walk for maybe 10 steps out of guilt, but picked back up to a run knowing the next four miles would be uphill single track and I wanted a good spot :) Hitting the trail felt so good. And just as soon as we hit it, we were walking. It was a 3,500 ft. climb in the first 5+ miles, and I was towards the front of a long train of people. There was no point in trying to pass, the incline was just enough that it would surely punish anyone greedy enough to pass. The sun began to lighten the side of the mountain we were climbing an hour or so in and I switched off my headlamp. 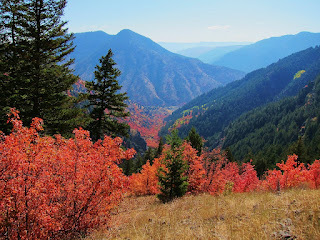 The canyon below us looked like it was on fire...the trees were beautiful!! A girl in front of me started up a conversation, but arriving at Little Baldy Pass opened up the trail and gave us some relief and I passed her up. 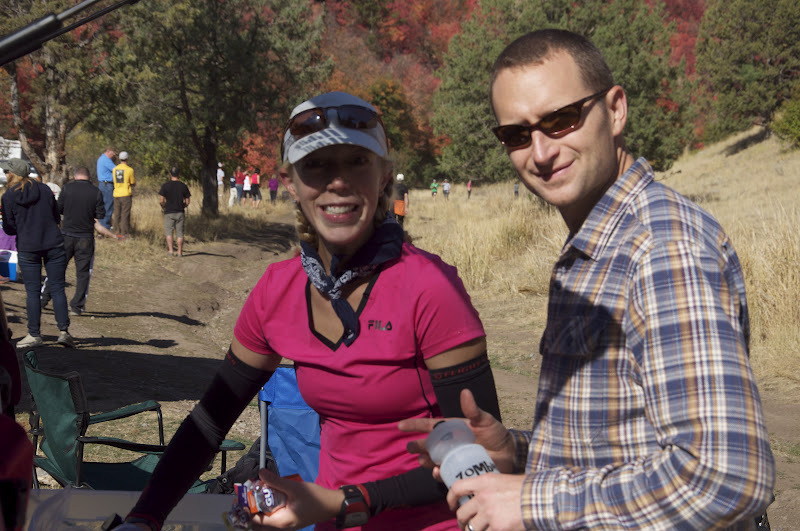 The first aid station is just below the top of Logan Peak, at mile 10.5. I sipped on come Coke, readjusted my shoe laces and then was out of there. After 5,400 ft. of climbing in those first 12 miles, we finally were treated to a little downhilling. The Leatham Hollow Trail may be my favorite part of the course, but I'm not sure. There were so many awesome sections. 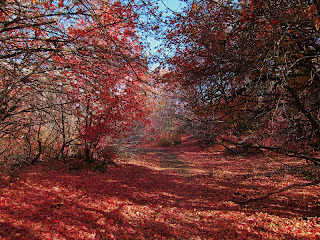 Leatham Hollow was stuffed with bright red maples. 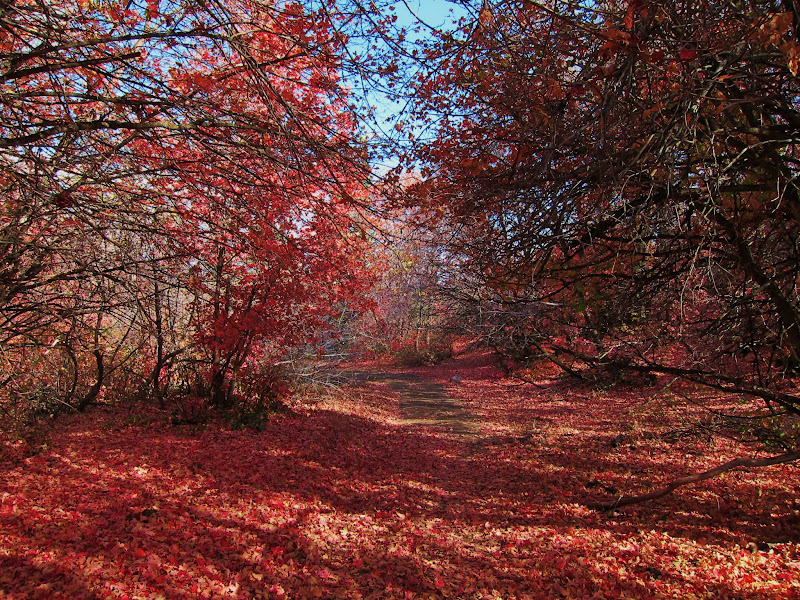 It was 360 degrees of red leaves above, alongside and below me. It was breathtaking, and the downhilling was top notch. 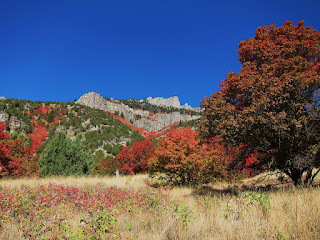 As I rounded a corner, the trees opened up and I glanced over to check out the view. The trail is cut into the side of a mountain and overlooked an enormous expanse of absolute grandeur. I was actually, literally breathless, it was so beautiful. I got a little choked up. I'm actually here; this place actually exists, I marveled. Nature is so flipping cool. 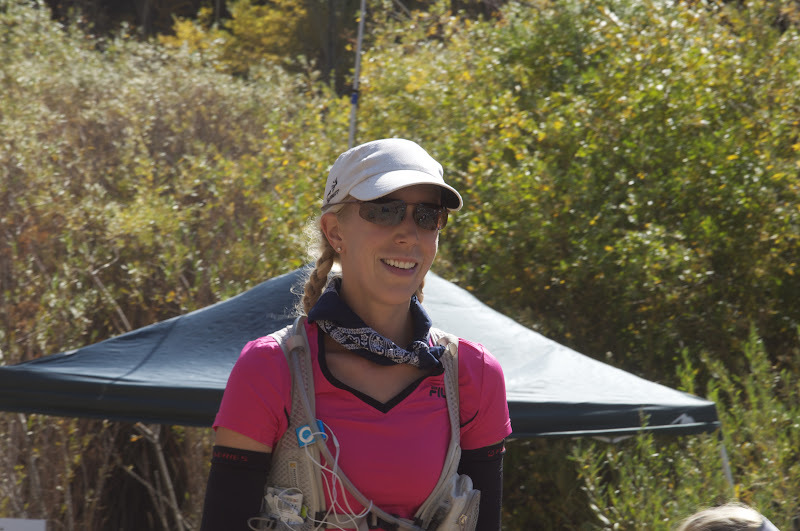 I sailed into the first crew-accessible aid station at mile 19.6 in a time that surprised me. I was on a 28 hour pace. It was starting to heat up just a touch, and I knew it would reach into the 80s at some point, but I kept on my sleeves for sun protection and a bandana to protect my neck. I ain't no redneck ;) I felt so good. 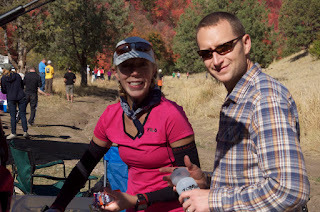 Grabbing some gels from the aid station and chugging a bit of Gatorade, I was out of there. The next station was just three miles away, up a gravel road. It was a gentle uphill grade so I ran most of it, iPod plugged in and motivating me up the warm road. I grabbed another gel at the aid station and a Coke, then continued on. This next section was a five mile, 2,000 ft. climb up to Richard's Summit and I power hiked the whole way up. I got into a rhythm that felt awesome and never stopped. I must have passed a dozen or so other runners doing this. It was invigorating. I was moving so well and staying within myself, keeping on task. When I pulled into Cowley Canyon at mile 29 I refilled my pack, grabbed some gels and a Coke, then walked down the hill to where the crews were stationed. Geof and Rob had just pulled in when I walked up. I was a bit ahead of schedule I guess :) Now on a 27.5 hour pace, I just said hello and headed back out. This next stretch was a bit of a grind in terms of terrain and sun exposure. It was an uphill climb on a gravel road initially, but once I crested it, I broke free and ran the rest of the way. It was a pretty flat section so running was easy, but it was hot and dusty. I just adjusted my pace to keep from overheating and let my music distract me. I saw a girl, Tonya, that I had been back-and-forth with much of the morning and decided to let her pull me along. I caught up and stayed behind her, running just a touch faster than I would on my own. Her pace was perfect. On flats she was stronger, but I passed her on climbs and descents. We were a good 'team' :) It was hot, but it never got to a point where it was bothersome for me. I heard a lot of complaints about the heat from others after the race, so I'm glad I was able to keep it in check. After a delicious 2,000 foot descent, I arrived into Right Hand Fork. 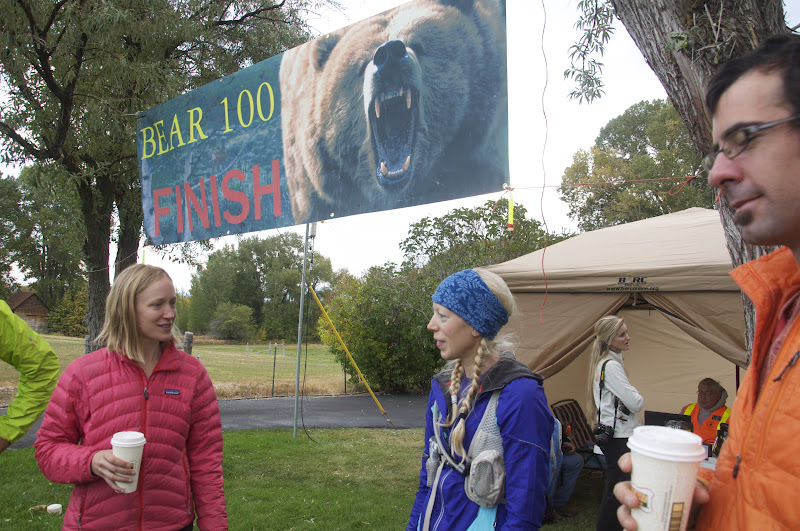 One of the many things I liked about this race were the placement of aid stations. 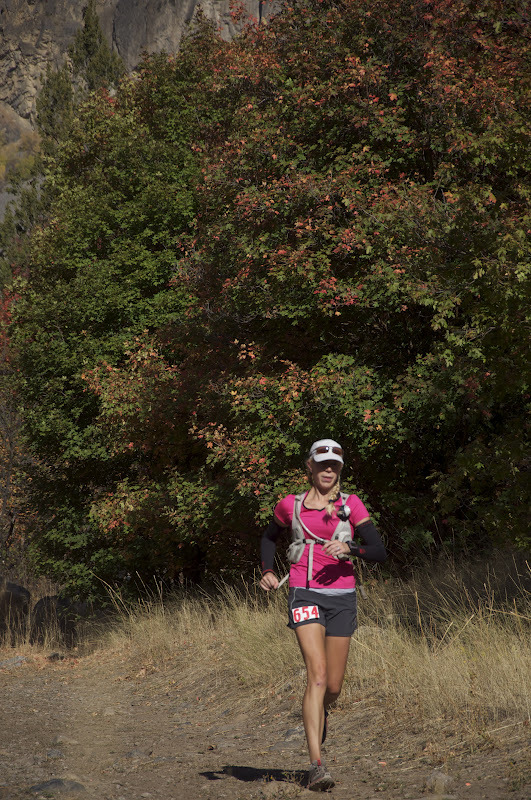 They always came after a long descent, and you always had a long climb out of an aid station. As soon as you started downhilling, you knew you were close to an aid station. I like that. It's like a little carrot on a stick :) At Right Hand Fork, I was stoked because it meant I would be picking up my first pacer, Rob, at the next aid station. Runners can pick up pacers beginning at mile 36.9 (Right Hand Fork), but that's a little too early in my opinion. I was doing awesome and was happy to continue the momentum. Tonya left the aid station just ahead of me, as usual, so when I saw her up ahead after a little while, I decided to pick up the pace again and catch up to her. There was some climbing to be had in this section, but it was all runnable. I just listened to my music on low and took in everything around me. There was a surprise water stop at the top of a dusty gravel road. At first I thought it was a mirage; I sincerely questioned my sanity for a moment. It was real! I filled up my pack as I was drinking more now that we were in the hottest part of the day. The water tasted like crap, but man was it refreshing. I got fuzzy headed a couple of times during these hot stretches, but I figured out that an S!Cap did the trick each time. I never tied fuzziness to low electrolytes before. But now I know! Tonya and I eventually ran side-by-side once the trail opened up to a wide gravel road, chatting it up. 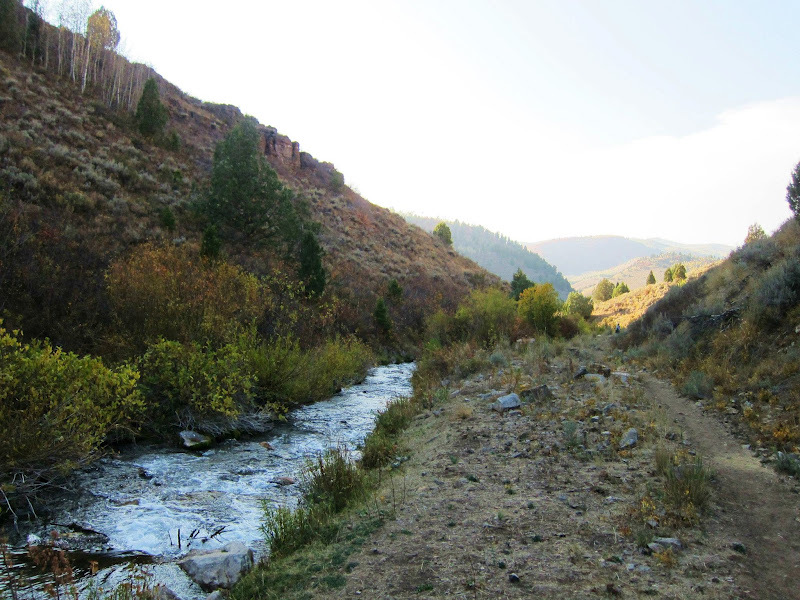 The route put us back on a gorgeous bit of single track through a slot with a river alongside it. It was beautiful and cooling. 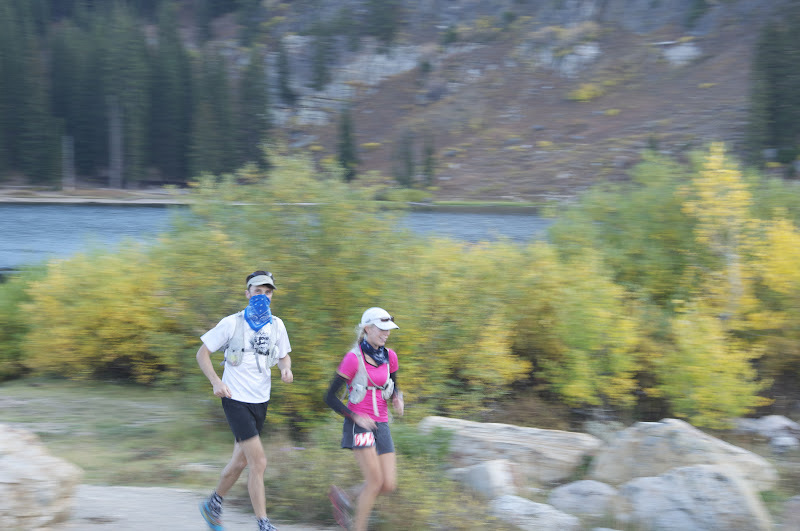 Passing along cows out to pasture, we dropped down into Temple Fork aid station at mile 45.1. Yay, Geof and Rob!! I put away my iPod, swapped out my Garmin, changed my socks for the first time, grabbed more gels from the aid station, and then chugged a cold vanilla Ensure. What? It sounded good at the time. After coming up for air I said, "I hope I don't regret that!" Then Rob and I were outta there! Let's get this party started! I was just informed I was now on a 27 hour pace. Now I had a little fire in my belly. And a little gas. I only slightly regretted the Ensure. If I had paid attention to the fact that we now had a 3,000 ft. and five mile climb up out of Smithfield Canyon, I might have held off on the chalky nutrition drink. I felt a touch blah. But, it was all good because it was steep enough that I wouldn't have run that section anyhow. I continued with my nutrition schedule despite the blah stomach though and knew it would pass. Rob was up ahead of me a ways, and we passed Tonya a short ways up the climb. 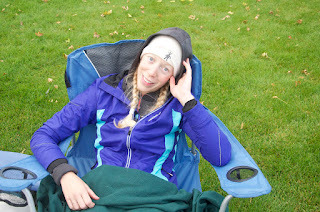 She was having stomach issues, and that would be the last I'd see of her until she crossed the finish line the next day (congrats Tonya!!!). I was belching like a freaking champ now. Vanilla-flavored belches. Which is better than puke-flavored belches I suppose. I bargained with myself here. And, yes, I was talking out loud to myself. Rob was far enough ahead that he couldn't hear me :) I told myself I could sit for a moment once we reached the top of the climb, as long as there was a clean log on which to sit. Otherwise, I was to keep power hiking. So I did. And when I saw a gorgeous felled birch alongside the trail at the top of the climb, I knew I needed to sit on it. At least it looked like a birch. Not really sure about that. Rob said, "not for long Dunmore." I told him it was my reward. He asked about my stomach and I noticed it was feeling better. 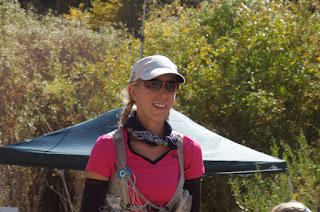 I was even happier to feel the gentle downhill grade as we ran the next mile or so through a cute campground and into the Tony Grove aid station. I was now over halfway done and had the majority of the climbing (14,763 ft. to be exact. Holy crap, that's a lot of climb in 51.8 miles!) out of the way. And still on a 27 hour pace. Booya! It was now officially cooling off, so here I decided to switch into a long sleeve shirt. I also grabbed my headlamp as it would be dark before we reached the next crewed aid station. Oh, did I mention I have THE GREATEST HEADLAMP EVER MADE? Yes, it's true. I used it for the first time at Bear 100, but after witnessing the amazingness of it when Gretchen used it for Hardrock 100, I simply had to have it. It's the new Black Diamond Icon, and with its 200 lumen power nothing was left to the imagination in the dark on the trail. I usually need two light sources to avoid getting tunnel vision, and because other headlamps are so dim, but not with my Icon! That baby is bright! So yea, that's my headlamp. I was now officially over my Ensure stomach bubbles (but still belching like a champ somehow...how unlike me ;)) and ready to do some real running. We headed out of Tony Grove and walked up a bit of the 800 ft. climb out, stuck behind two chatty Cathys. Rob said to let him know when I wanted us to pass at one point, so as soon as I looked ahead and saw the trail turn down, I gave Rob the word, and that was that. We were running!! And running and running. We ran the entire rest of the way together, chatting and laughing. I was having an absolute ball! The full moon was in view as we made our way across a large pasture in the twilight. If the trail hadn't been so rocky I definitely would have turned off the headlamp, the moon was that bright. Rob reminded me of my pace and asked if I thought I could break 27 hours. I thought it was possible. To which he said, "I think you can break 26, that would be awesome." Whoa, that sounded like a stretch. But not impossible. We passed a number of people in this section, and when we arrived at Franklin Basin, mile 61.4, I was an hour ahead of schedule. Geof was nowhere to be seen. But Matt was waiting at the trailhead for us! 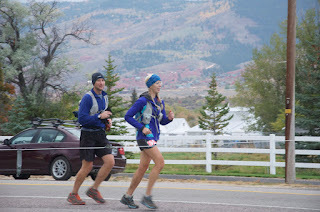 Matt Vukin was taking over pacing duties from Franklin Basin and I was super pumped to see him and glad that he was able to find the aid station. He worked a full day then made the long drive up to pace me. Rob trotted off to find Geof in the dark while Matt helped me gather some Coke and more gels for my pack. The race was using Hammer gels, which I quite enjoy so I stocked up on those babies every chance I got (Tropical is positively delish). Rob reappeared with Geof, complete with look of pure astonishment. "You're an hour early, baby!" "I know, I feel so good!" I grabbed my favorite powerstretch fleece from my duffle as it was getting cooler still. I also grabbed my Brooks wind jacket and tucked it in the cable ties on my pack, my thin liner gloves and a wool hat. We were off!! I knew the Logan River aid station was close by as we began a descent, and I was suddenly...stricken. I needed to use the potty. Bad. I tried to ignore it, but that wasn't happening. We were in a wide open area with very low bushes. I just couldn't do that. "Matt I need to use the bathroom." (What was I expecting him to say/do? What a weird thing to announce :)) "I think the aid station is coming up, you can use a porta potty there." "No. It can't wait. It's...complicated." "Oh! Well, I see trees ahead, lets get you there." A true ultrarunner in training :) I found a nice little grove of trees and commenced with ground fertilization. That needed to happen. I'm sorry mother nature! I felt brand new! We continued our cruise through the non-crewed aid stations, over and through some streams, and eventually I had to put my jacket on. It was downright cold! But it made for great running. And run we did all the way into Beaver Lodge at mile 75.8, and where I would be picking up my final pacer, Geof. The guys huddled around my pace chart while I changed my shoes for the first time, from my Salomon XR Missions and into my La Sportiva Raptors. That felt good. The guys were quietly chatting and then I heard some giggling. Dude giggles, people. It felt like I was doing something right. After I finished my shoe swap, I ran up to the lodge to pee and grab some Coke and when I came out the guys were all waiting for me. It felt like heaven washing my hands. Pearly gates Heaven. Then we were out of there. It was now SUPER cold. So we ran. 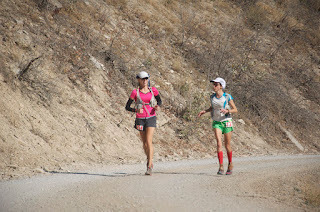 There were only two more crew accessible aid stations and I looked forward to both of them. 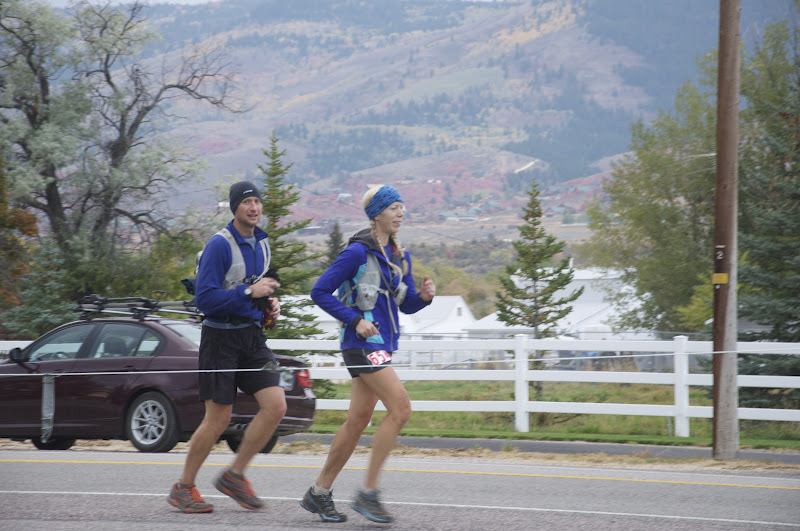 Meantime, Geof shared what they were giggling about, "You're on a 26.5 hour pace now." I responded with something cool and collected-sounding I think, but I was thinking more along the lines of, 'holy mother eff, how in the sh** have I done that?!' I was surprised. Now I really needed to run. Well, mostly because it was frigidly cold, but also because there was no way I was going to let myself slow down now. Most of what I remember of my race is running. I ran so flipping much during this race. I would estimate I walked a total of 15 miles tops. Where did that come from? Somewhere in this stretch we crossed the Utah/Idaho state line. I saw that it was just barely 2:00 a.m. and I recall feeling incredibly stoked to see that I made it there in the dark. Now I really knew I was doing well. 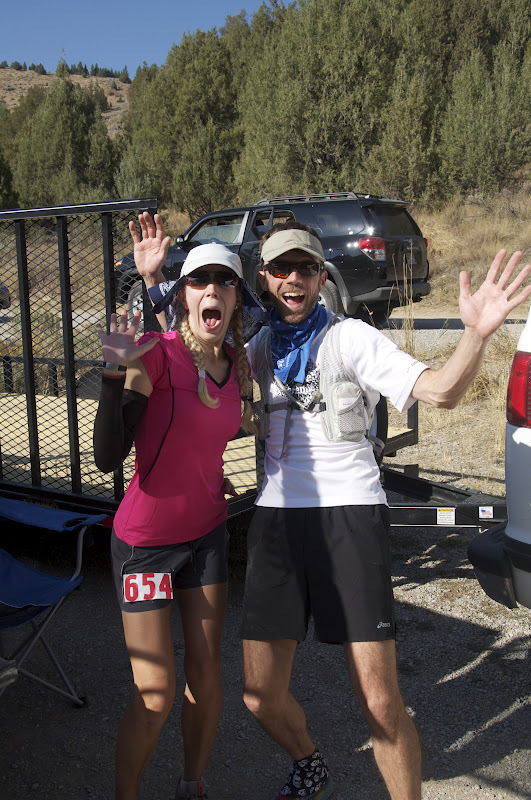 We arrived at Gibson Basin, mile 81.1, and I downed a cup of hot chicken noodle soup. I was maintaining pace, and even sped up a little bit. As I stood there in the cold, I got a little lightheaded feeling and said we needed to get going. Rob swapped out my Garmin again and we got back on the trail. Whew that was weird. Stopping is hard in the cold. Makes you feel wonky. 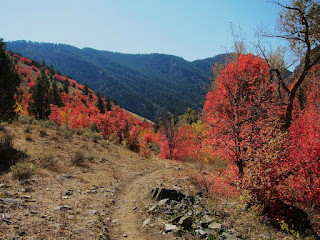 I shook out the wonkiness as we made our way up to the Beaver Creek summit. An aid station was a couple more miles beyond the summit and had a roaring fire. I skirted around it to grab some gels from the table, but had to walk beside it to check out. There were two runners camped out at the fire, and I had no interest in getting sucked into that. So we were out of there fast. The next mile was on a long flat dirt road through a field. It was frozen solid, but easy running, underneath the intensely bright full moon. Just another 1,000 ft. climb before we began the descent down into Ranger Dip, mile 92.1, and the last crew stop. We arrived early of course, and surprised Rob and Matt. We were set, though, and just stopped to say hi before heading out. I was on a roll. Up next, we climbed almost 1,000 ft. in less than a mile. I thought this particular climb came closer to the finish, so it took me by surprise. Of course I was quite pleased with how well we were climbing, and was overjoyed to reach the top, Gates of Paradise, mile 93, because that meant a seven mile cruise down to the finish line. Just a couple miles later we passed a couple runners, including a woman with polls stepping gingerly through a really rocky section. I kept the momentum going and we whizzed past her as she looked up, semi-horrified at what she was seeing. She was the gal I was hiking behind at the very beginning of the race. I was going to finish this thing. And in fine style. I was still keeping on top of my nutrition and paying attention to my body. My right ankle was the only thing bothersome, from tying my shoe too tight earlier in the evening. Otherwise I could NOT believe how good I felt. Knees, calves, shoulders, head, everything. I pondered my training and how I was able to pull this off. I felt that I trained adequately, but I never would have guessed that I would do so well at this race. I glanced at my Garmin and saw that a sub-26 hour pace was within reach, but I would have to run pretty hard the entire rest of the way. As I took in the mountain we were about to descend I surrendered any and all doubts. It was a steep, rocky and dusty downhill but, screw it, I'm doing this. It hurt, a lot. It was very steep and I was trying my best to not brake too much. I could smell the finish line, I could feel it. The sun was rising on the other side of Bear Lake and it was just light enough that I turned off my headlamp. The sun would be rising into a thick wall of clouds though. "It's too bad everyone behind me is going to miss this sunrise." It was really quite amazing. Then it began to snow, and as we dropped further and further down, it became a very light drizzle. I didn't care. That finish line was so close. 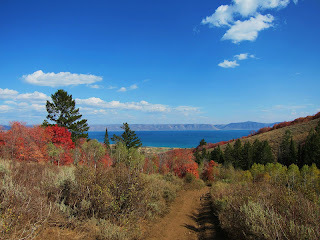 Bear Lake down below, and the finish line! The trail dropped us down to French Hollow Road, which looked like this. I know, seriously. We dropped down, down, down, then climbed back up a bit after passing through a fence. Holy crap, more climbing?! Then the trail swooped back down and spilled out onto a paved road that wound through sleepy country farmland. A turkey ran across the road. An ATV passed by, waving. I glanced back down at my Garmin. Wow I'm really going to do this. I could walk the rest of the way and still do this. As the road hit a T intersection and we were to turn left, I barked out loud, "Bahhh!" Pushing, pushing, pushing. Don't stop until you finish. "Ugghhh!" "Oh my god, I can't believe this," I said under my breath, almost about to break into tears of exhaustion and absolute joy. Geof just chuckled quietly. "Yea, PAIGE!!!!" I glanced over and there were Ben and Bethany with Little Squid cheering me across the finish line! And what an anti-climactic finish line. I guess that's how it is when you finish faster than usual. Not a lot of people hanging around, so I was even more stoked to see such familiar and wonderful faces. Official time: 25:52:30. Seventh woman, 37th overall (out of 230 starters). Stout. I'm a f'real mountain 100 runner now. I feel so...grown up :) Pondering just how on earth I pulled this race off, all I can come up with is that I didn't stop the momentum. I ran parts I would have normally walked, and when I did walk, it was fast. I didn't get lazy and drag my feet at any point. Ultimately, I wanted to see what I was really capable of on my own. Geof is a very strong runner and I feel like I rely on him to set the pace and pull me along most of the time. I wasn't entirely sure I would be able to replicate that on my own. I guess you could now say I can. That feels good; to know that I have the ability to race. And now I want to do it again and again and again! Also helpful, a very happy stomach (overall) and very happy feet. This is the first time I have ever been able to use gels the entire race. Start to finish. I took a gel every 40 minutes and never ever got away from it. That's almost 39 gels folks. Thirty-nine packets of pure Hammer and Gu joy. I only took salt when I felt fuzzy, or if my stomach began to get sloshy (usually about every 3-4 hours), which is different than what I've done in the past (salt every hour). Coke was handy to preemptively ward off the sleepies, which never did come. An Ensure (which I won't do again) and a cup of chicken noodle soup. That's it. And it worked. My feet were super happy. Zero blisters, no black toenails, and just some bruising where my laces were too tight on my right foot. And my knees, SO HAPPY! I usually have sore quads right above my knees after even just a short bit of hard downhilling, so to have no soreness there after this kind of race, I actually couldn't believe it. Climbing up and down the stairs the next day further bewildered me. I felt better than I did after Javelina last year. How is that possible? I don't know, but I'm not complaining. YYYYEEEEAAAHHHH!! So. Freaking. Awesome. Paige! Sounds like you did this one just right, and it was so much fun to read your report. I got all excited and teary! You totally earned this. Awesome work!!! I hope to someday have a race of my life like yours! I'm so happy for you. Congratulations on such a strong race. This looks like a beautiful and tough course. You've got the wheels in my head spinning right now, dang it (that's Utah for damn it). Wow! that was really an wonderful description of a great event. These kind of events surely makes one to feel excite. Amazing race, Paige!! I'm thrilled for you! @SFAK - Thanks for reading! I love reading your blog because you write so well and you tell your stories so well. I get sucked in the way I do with a good book, and it's awesome to finish and realize everything I've just read is real! 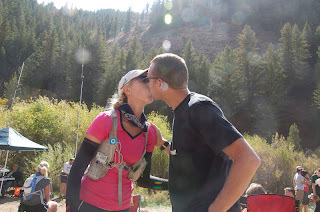 Your race recaps always make me want to register for and run a trail ultra...maybe now that my first marathon is run an ultra will be next on my list. Oh! Oh! Belated Congrats for an awesome race. I've been living in the bubble of the PCT. So impressive! This sucker is a HARD one, and your time is frickin' unbelievable. You really did rock it and it sounds like you had a good time doing it. Congrats, lady!